I recently attended the Exact Target’s Connections 2011 event, a user conference on interactive marketing. One of the takeaways from their education sessions came from the speakers – although they weren’t speaking at all. Social proof is a tried and true tool of persuasion. We know that consumers are much more likely to listen to what their peers think than to be swayed by messages coming from brands. That is the reason why customer testimonials and product reviews are so effective for websites looking to make a sale of some kind. Besides the overt types of social proof we see online, there are plenty of ways to convey how you feel about a company in a more subtle way. It’s been said that over half of communication is delivered non-verbally through body language. 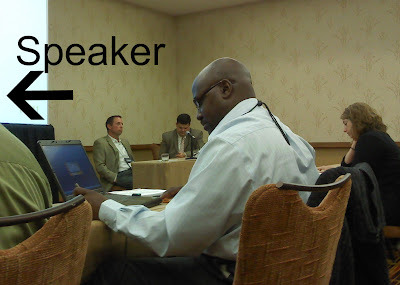 That’s unfortunate for some of the speakers I witnessed trying to present at the show. 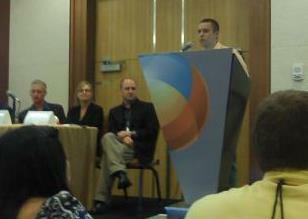 Many of the sessions I was in featured a panel, with each speaker taking a turn at the podium while the others waited. Take a look at the view from the audience. The poor speaker (who is out of the frame here) is trying to make a point that he thinks is important while sharing the floor with these guys. This wasn’t the only session either. I wish I would have snapped a picture of the first class of the day when the panel was still waking up. They were literally yawning on stage, totally undercutting the presenter. 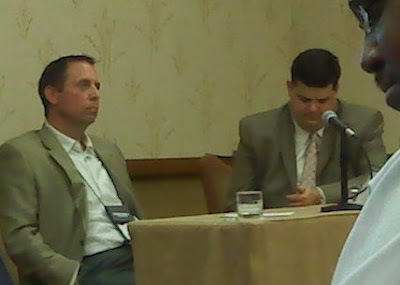 These panelists are actually giving their speaker some eye contact and following along. Much more respectful and helpful to the audience too. Just an observation that little signals can communicate a lot to the audience, either online or offline. And a note to self – next time I’m speaking on a panel I’ll have to remember to buy some coffees for the group on stage!